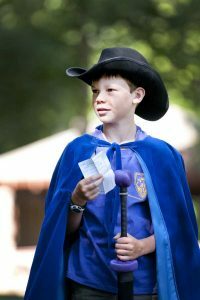 Critical thinking and reasoning skills are developed and practiced within our programs, within the experiential framework of a live-action roleplaying game that emphasizes a very well-rounded set of challenges. Many studies have demonstrated that children who lack strong reasoning and critical thinking skills are less likely to succeed in the more “practical” fields of physics and mathematics. See “Developing Thinking and Problem Solving Skills” in the Introductory Mechanics textbook, and the references therein (V.P. Colletta & J.A. Phillips, PERC Proceedings, 2010). In an article titled “Fantasy Role-playing for Mutual Aid in Children’s Groups” (Drs. Zayas & Lewis, Social Work with Groups, Volume 9, Issue 1), the researchers illustrate how three boys with ADHD were presented with a scenario in a fantasy roleplaying game that required them to work together. The children began the scenario by doing what they always did—rush into the challenging situation without a thought to the best way to overcome it. After an initial failure (a failure that was both physically and emotionally safe), the boys thought ahead to overcome challenges with more patient collaboration.